(1) The factory dash and courtesy harnesses are 2 separate components - the dash harness itself has 1 accessory lamp (168/194 bulb) housing that plugs in over the AC switch, the courtesy harness provides 3 more which plug in various locations from roughly center dash to far left. The 3 courtesy harness lamps are not coming on with the headlight switch, the dash harness lamp unit does come on properly. (2) the under-dash map light unit does not turn on now - bulb is good and there is full-time power at the switch with 12v measuring at all terminals (there are 3 connector prongs to the switch but the courtesy harness only provides 2 actual connecting wires, an orange inside an angled 2-space connector and a separated black wire. Orange is part of the angled 2-space connector (there is no 2nd wire to it, same as my original harness) and the separate black goes to the single connector (above the switch) across from it - all 3 terminals are full time hot with the orange connected and the black wire terminal shows power with the switch only in the ON position. Power at both sides of the bulb with and without the switch in the ON position, but it does not light - I did try a 2nd bulb to ensure it's good). The 2 large interior underside courtesy lamps (1 @ end of the dash) do come on as they should with either door opening and I did install new door jamb switches. The left switch has white and black wires going to it, the right side only a white, per the factory harness design. . Both new harnesses are identical factory replacements - dash harness is M&H, courtesy harness is American Autowire. I'm wondering if my original headlight switch may be at issue and plan to try another one once obtained. Any other ideas in the interim would be appreciated! Last edited by 70sgeek; December 19th, 2018 at 06:11 AM. Both issues are related. That black wire in your picture should be connected to ground at all times. It also provides the ground for the three additional dash lamps. I just so happened to have bought a Autowire courtesy harness to get some new lamp holders last week! My wiring is 90% custom so I struggle to remember the stock setup. The ground wire in that harness ends in a round lug near the leftmost dash lamp holder. That must be grounded using one of the dash mounting lugs - in this case, the one by the wiper switch. Remove the 11/32 speed nut, slip on the grounding lug, reinstall the nut. Voila! The stock setup for the map light provides power at all times (orange wire) and connects the ground when you move the switch. 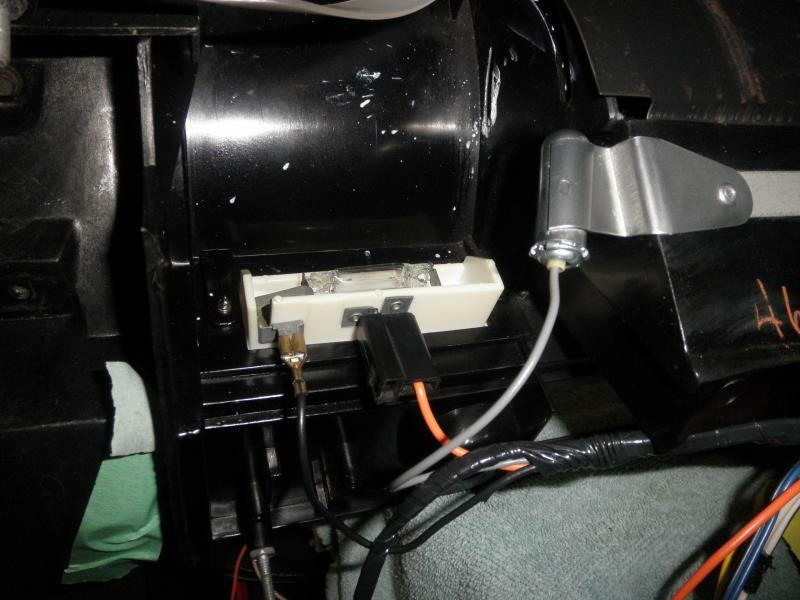 The unused lug in that 2 shell connector is connected full-time to the ground side of the bulb and can be used to turn on the map light with the door switches by using some extra wiring and a diode(*). It's unlikely the headlight switch is a problem. All it does is provide variable voltage to the grey wire and grounds the black/white wire when the **** is turned all the way to turn on the dome light. When I've seem them go bad, it's the resistor wire breaks so the dash lights don't work at all. In any case, I wouldn't bother with an OE switch. Just get a name brand replacement switch. It's a very commonly used GM part, so they're plentiful. (*) you can connect that extra shell directly to the black/white wire that feeds the footwell lamps. The problem is now all the courtesy lamps will turn on whenever you turn on the map light. Add a diode going from the map light courtesy connector to the courtesy ground (black/white) to prevent the other courtesy lights back-feeding through the map switch. No idea if this is precisely what they intended in the early 70's (diodes were still fairly exotic then, yes? ), but that's my hack. Oh, so if you're bench testing this, note that you need to provide a ground to all four of the dash mounting lugs along the bottom of the dash and secure all the ground strips and wires connected to them. They ground to the body when the dash is installed. You may need to scratch up the mounting areas on the body if it's freshly painted. I did recheck my ring-terminal grounding wire on the courtesy harness - it is securely fastened to the same mounting location the original came off. All bulbs are good and the large interior lamps do come on when either door is open, so not sure if (or where there may be a wiring ground issue. I first thought the map light black wire was supposed to be a ground - the switch is wired in identical fashion to the original courtesy harness install. I didn't check the terminals for power characteristics prior to removing the old harness, since everything was in working order before - at this point even with the black wire disconnected from its terminal, the terminal reads hot coming off its inter-connection to the orange side of the assembly. 1 out 2 problems appear resolved - I removed the black wire from the map light and grounded it to dash frame - that brought my 4 headlight switch-activated accessory lamps back.